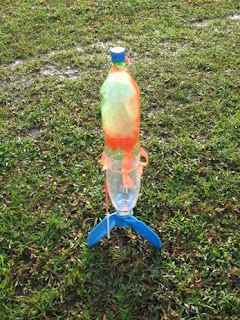 Water rocketry is a term to describe the designing, construction and launching of a bottle rocket with water being its main source of fuel and thrust. In this project, the water rocket was developed to achieve certain altitude for remote sensing purposes. Abiding the law of physics, various considerations on the designing of the water rocket was conducted during the course of the project in order to ensure maximum performance of the water rocket. These designing aspects includes the aerodynamics of the rocket, the amount of pressure required, usage of fins and nose cones, pump and nozzle design and various other details which all add up to the variations in the water rocket's flight performance. On the other hand, several types of sensors were proposed and developed for this project to be installed to the water rocket during its flight. These sensors include aerial photography by using a micro wireless camera unit, altitude measurement by using an altimeter and light detection and emission by using a photo detector circuit. These remote sensors itself must meet several requirements during its design and implementation stage in order to ensure that the water rocket and the remote sensors both are efficient in performance.